KASTO is further expanding its global presence. With a formal ceremony, the sawing and storage specialist opened its new sales and service centre in Taicang in the east of the People’s Republic of China, north-west of Shanghai, on 15 May, 2018. 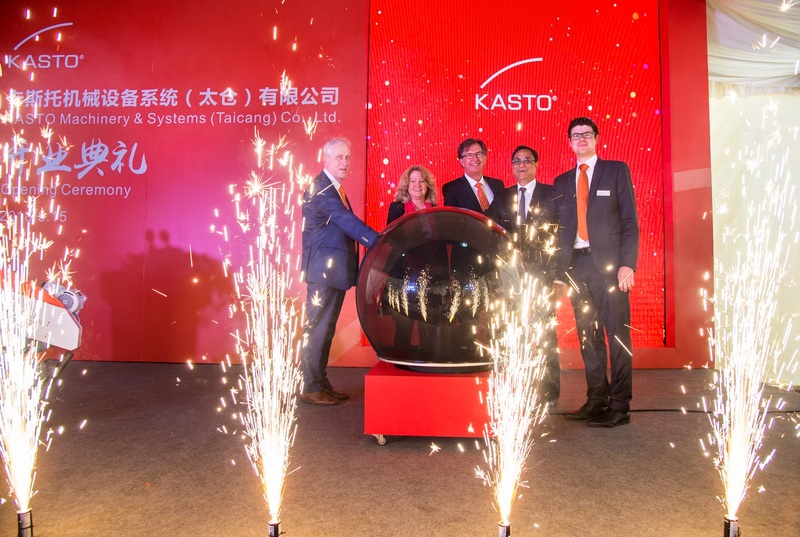 The opening was attended by numerous customers and business partners from the whole of China as well as government representatives and three members of the KASTO Group board. The new subsidiary will ensure fast and direct service as well as providing comprehensive consultancy services in the growing Chinese market. At the same time, the regional and linguistic proximity to the customer is a major benefit. In future, sawing and storage solutions will be demonstrated, digital solutions presented, and test cuts carried out in a well-equipped showroom. Armin Stolzer, Ruth Stolzer and Jonathan Riegel from the KASTO Board of Directors travelled specially from Achern in Germany. In their keynote speeches, Armin Stolzer and Jonathan Riegel justified the choice of location, and introduced projects and visions. The conditions in Taicang are ideal: it is conveniently situated, has connections to container port and airport, and the local cluster, particularly of South German companies, is large. The standard of training in the region is correspondingly high. All this creates the ideal prerequisite for KASTO’s objective of successfully supporting its customers in the implementation of Industry 4.0 structures, which are also aspired to in China. As an example, Jonathan Riegel cited automatic, energy-efficient and above all networkable storage solutions, sawing and handling concepts which make decisions autonomously, and modern software solutions which are optimally matched to the customers’ systems. The presentation also addressed highly topical subjects such as augmented reality by showing how technologies such as Microsoft HoloLens or Apple’s ARkit transfer planning work and after-sales service to the digital age. Guests were subsequently able to interactively experience both solutions in a virtual showroom. Along with the traditional dragon dance and the formal touch-ball ceremony, the opening agenda included live presentations of storage and sawing concepts. Customers and users were therefore able to take a close look at the KASTOecostore 1.2 and UNIBLOC storage solutions as well as the various semi and fully automatic sawing machines. KASTO Maschinenbau GmbH & Co. KG, based in Achern, Germany, specializes in sawing and storage technology for bar stock. The company is a global leader in the manufacture and sale of metal-cutting saws and semi-automatic and automatic storage systems for bar stock and sheet metal. It is also a leading manufacturer of automatic handling systems for metal bars, sheet metal and pre-cut parts, as well as the corresponding software. One of Europe’s oldest family-owned companies, KASTO celebrated its 170th anniversary in 2014. In the course of its successful history it has registered 170 patents, delivered more than 140,000 sawing machines to all parts of the world and installed more than 1,900 automatic storage facilities. In addition to a branch in Schalkau, Thuringia, KASTO has subsidiaries in England, France, Switzerland, Singapore, China and the USA.